What a weekend it was. Glorious weather. 80s, windy, but great. I took by three-year old son with me to San Marcos, a beautiful little city, thirty miles south of Austin and home to Texas State University, where my wife is a professor. There he and I played golf at the little 9-hole university course. The course is great to play with a three-year old, because there is never anyone playing that cares about golf etiquitte. We had a great time. He ran around like crazy. Used an extra club of mine to punish the fairway in hopes of hitting a golf ball. Welcome to our guest bloggers from San Francisco and Houston. Nicole, the loud birds are “Grackles“, and they are real pests. Ugly too. You’re not quite in time to see our bats; they are just starting to arrive from Mexico. But come back in September and they will be spectacular. Don’t limit yourself to Sixth Street. Head over to the Warehouse District. Many more places there and there’s the free ‘Dillo to get you there. There are tons of other ideas for food and drink (including the Threadgills, where Janis Joplin was discovered). Explore and have fun. They’re also known as Texas peacocks. Some people don’t realize that those large, handsome, iridescent black fellows have smaller brown wives with short tails. 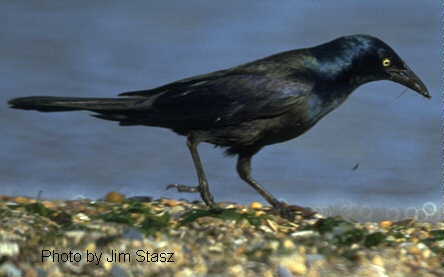 Wild grackles are happy to eat insects; citified grackles will sweep right down and take the Fritos right away from people. Just don’t walk under a tree where there’s a roost after it has been raining; the liquified substances on the ground do not give off one of Nature’s best aromas.